Dr Sandy (Chiropractor) conducting a Report of Findings. For all of our clients this visit is reserved for the Report of Findings. This will be a review of the tests conducted during the History Consultation and Examination as well as what Dr Sandy (Chiropractor) has found and what this means to you. Dr Sandy (Chiropractor) will then spend some time talking with you to determine and agree on how best to go about the task of achieving your goals in the recovery of your health. 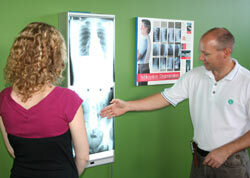 Learn more about a regular visit at Sandy Clark Chiropractic.